When you go to Bali, you don't want to miss best Bali Cuisines. The traditional food and the richness of the spices will make your adventure perfect. Nasi Ayam Kadewatan is another famous warung also located at West Ubud. They recently opened a new branch at Petingenget area, which is more accesible from Kuta. There is only one menu at this warung. It is nasi ayam, that is, steam rice with pindang egg, shredded chicken, betutu chicken (Balinese style cooking), fried peanuts, urap (vegetable), and all other parts of chicken such as: skins, livers and intestines. I believe that this is one of the most authentic Balinese food you must savor on the island. 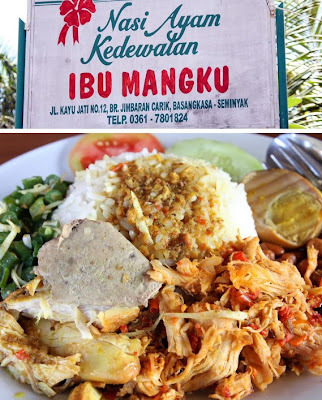 If you like hot and spicy food, you can’t go wrong eating at this warung. 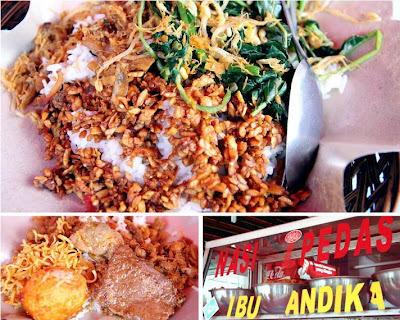 They have a wide variety of meals you can choose: beef, chicken, tofu, tempe, vegetables, fried noodle, and egg balado. Almost all their meals are spicy. If you want spicier, you even can order more chili on the side. My top suggestion is their chicken skin, which is my favorite food at this warung. Note that this place is a real warung, not a fancy restaurant. Bumbu Bali is the first up-market restaurant specializing in authentic Balinese delicacies. Heinz von Holzen, previously worked at Grand Hyatt and Ritz Carlton-Bali, and his Balinese wife, Puji, opened their own restaurant, called Bumbu Bali. Heinz is the author and photographer of “The Food of Bali” and “The Food of Indonesia”. He also hosts Balinese cooking lesson at Bumbu Bali as a continuation of writing his books. 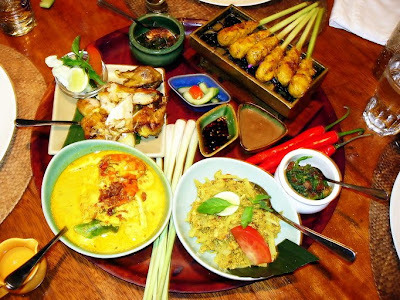 All dishes served at Bumbu Bali were well prepared and presented. The ambiance is also very nice and relaxing, just a perfect place for couples or families who want to treasure their holiday time. Ujung Water Palace, which by the local people is called as Taman Soekasada Ujung, was built in 1919. However, the launching of this complex of water palace was performed in 1912. 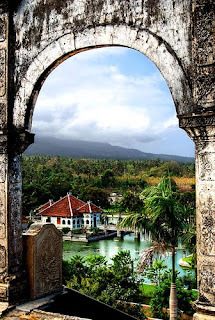 The water palace was constructed by the late King of Karangasem, I Gusti Bagus Jelantik, that reigned in Karangasem between 1909 and 1945. Ujung Water Palace was majestically built to welcome and to serve important guests and Kings from neighboring countries, besides for the pleasure of the King and his royal family. Taman Soekasada Ujung lies at Tumbu village, Karangasem district. It is approximately 85 km from Airport Denpasar and 5 km from Amlapura. Tourism activity in this area is supported by the available of food stalls, small restaurants and quite large parking area. Visitors who are interested in local crafts product can find some of them in art shops available here. Taman Soekasada Ujung has been announced to be a cultural tourist object for it is noted as one of several cultural heritages exist in Karangasem regency. The complex of this water palace is the combination of Balinese and European architectures. There are 3 big and large ponds inside the area. In the middle of the main pond, there is a building that connected to the edge of the pond by 2 bridges. On the most tip of the highest level of this complex, we will find a great statue of "warak" (rhinoceros). Beneath the warak there is a Bull statue. From this high place we will see a marvellous view of sea, hills with lush and green forest, the beauty of Mount Agung combined with the green terraced rice fields. Bridge crossing Tukad Bangkung, located at Plaga Village, Petang District, Badung Regency, Bali, was inaugurated back on Tuesday, December 19th 2008. Connecting three regencies of Bali namely Badung, Bangli, and Buleleng, the bridge is currently the longest one in Bali and the highest one in Asia. 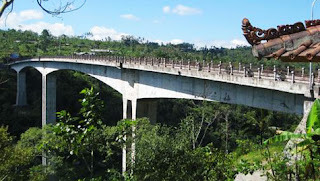 The Bridge of Tukad Bangkung has 360 meters length and 9.6 meters width. The highest pillar is at 71.14 meters height plus 41 meters foundation dug down into the earth. Built in balanced cantilever technology, the bridge is expected to last 100 years. To minimize impact to magnificent natural beauty in the area, the bridge was not built with canopy. The construction is predicted to stands earthquake up to 7th Richter scale. The bridge replaced the older one located about 500 meters away to the south. Ngaben cremation ceremony is held in Bali, especially by the Hindu religion, where religion is the majority Hindu island in the Thousand Temples. In the Panca Yadnya, including in this ceremony Pitra Yadnya, the ceremony is intended to lelulur spirit. Ngaben meaning of the ceremony was essentially a return to ancestral spirits (of those who have died) to the place of origin. A man has Pedanda said Davis, sayings, eyelash, and after Davis died, sayings, IDEP is returned to Brahma, Vishnu, Shiva. Ngaben ceremonies are usually held by family relatives of those who died, as respect of a child against her parents. In this ceremony is usually to spend 15 million fund's 20 million rupiah. The ceremony is usually done with the flamboyant, no sob mourning, in Bali because there is a confidence that we can not mourn those who have died because it could hamper travel to the spirit of the place. Day of Ngaben determined to find a good day is usually determined by Pedanda. Several days before the ceremony was held Ngaben families assisted by the community will create a "Bade and cattle", which is made from wood majestic, colorful paper and other materials. "Bade and cattle" This is a place where the corpse will be carried out Ngaben. Morning when the ceremony was held, families and relatives and the community will gather to prepare the ceremony. Corpses will be cleaned, or what's called "Nyiramin" by the community and family, "Nyiramin" is led by people who are considered the most elderly in the community. After the corpse will be traditional Balinese dress like people who are still alive. Before the event peak implemented, the whole family will the past and provide a nice spirit of prayer get a good place. Once everything is ready, the corpse will be placed in "Bade" Bring to troop to the grave where Ngaben ceremony, accompanied by a "gamelan", "sacred ballad", and followed the entire family and community, in front of the "Bade" there is a white cloth meaningful long as the spirit opening the road to the place of their origin. At each junction or the crossroad "Bade" will be played 3 times. Arriving at the grave, Ngaben ceremony was held with corpses lay in the "cattle", which has been prepared begins with ceremonies and prayers of the mantras of Ida Pedanda, and "cattle" to be burned to Abu. Abu is then removed to the Sea or the river is considered holy. After the ceremony, the family can quietly pray from the ancestral shrines and holy places respectively. This is the cause of family ties in Bali is very strong, because they always remember and respect lelulur and also their parents.There is a belief that the ancestral spirits that reincarnation will be back in the family circle again, so is usually a grandchild is a reincarnation of her parents. A visit to this tropical island would not be complete without having a taste of its unique cuisine. Dining in Bali can provide unforgettable moments, from 5 star gourmet experiences to breezy open sided bamboo cafe. Balinese authentic food itself is rarely served in most restaurants or hotels. The suckling pig, lawar, and variety of satay, are often cooked specifically for festivals or ceremonies. Nasi (rice) is a staple of the daily Balinese diet and is usually accompanied by vegetables, sambal (hot chili) and a small amount of fried fish or meat. Meals are usually prepared in the early morning by the wife/mother; the family will eat the meal throughout the day. 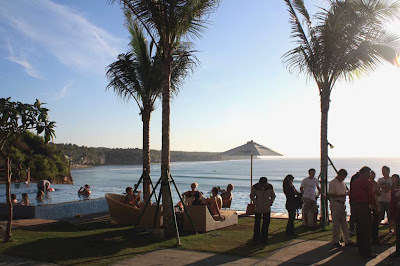 If you are interested in seafood, Jimbaran is the best choice with many restaurants along the white sandy beach. The Jimbaran Bay seafood restaurants serve a wide selection of fresh seafood, grilled to order. 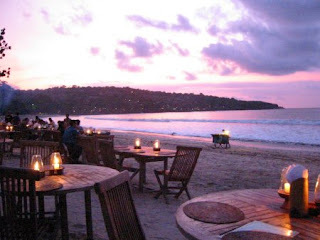 You can enjoy spectacular sunset view and Jimbaran's beaches over cracked crab and a cold beer. In addition to local Balinese and Indonesian fare, the island's list of restaurants covers a wide variety of excellent venues at varying price points. The restaurants are spread around most of the major tourist areas, in particular, Kuta, Legian, Sanur , Ubud, Candidasa and Lovina. Despite its population and its popularity as a tourist destination, Bali has maintained a significant variety of wild species. Indigenous to Bali are hundred of bird species and a variety of small mammals, including macaques and monkeys. With a growing human population and a shrinking forest habitat, many animal populations are having a hard time in Bali. Modern technology, such as liquid herbicides introduced to control weeds in rice cultivation, have had a negative impact on the ecosystem. An unintended consequence of all these factors is a decline in local species. The last tiger on the island, for example, was spotted in 1930s. In recognition of this increasingly critical condition, the government has taken some steps. The most significant effort is Bali Barat National Park which spans a significant portion of the western half of the island. The Park's main aim was to protect the preserve habitat and give shelter to rare bird species, such as the unique Bali Mynah. Bali Barat National Park has become a popular destination for amateur ornithologists. 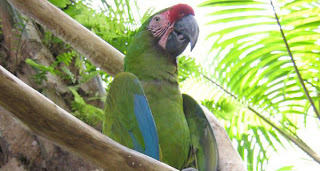 The park supports a large bird population. If you would like to see a large collection of Indonesian birds without having to trudge around in the jungle, you can also visit the Bali Bird Park which is home to thousands of birds from Bali and Indonesia -- probably your best bet for seeing the rare Bali Starling. Another impact affects the monkey community in particular and can be seen at tourist destinations such as Uluwatu Temple, Sangeh, Alas Kedaton and the Monkey Forest Ubud. Temples have always been a minor source of food for the local monkey populations (they raid the donations left at the temples), but with the large number of tourists now adding their "donations", the population is at risk from dependency on these handouts. One doesn't have to be on the island for very long to appreciate that Balinese life seems to be an endless parades of rites and ceremonies. 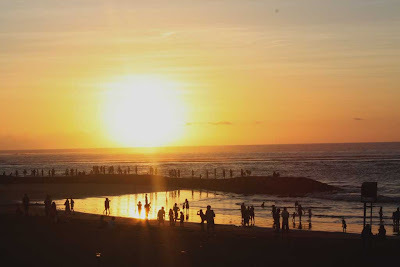 The combination of Hindu religious rituals and the local "Adat Istiadat" of the Balinese result in a cycle of events which paces the sun and the moon through the seasons. Ceremonies also mark the procession of human life from the womb to the grave. The various ceremonies center on different parts of Balinese life. Ceremonies for the gods are much different than the ceremonies for man. For example, Odalan is a ceremony for the Gods and the anniversary of a temple; this is the time when God is invited to bless the daily prayers in that temple. Two of the most visible ceremonies are concerned with man. 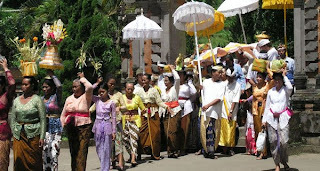 "Metatah" or the tooth-filing ceremony, is for Balinese 16-18 years of age. This ceremony is as a sign of maturity and indicates that the kids have reached the age where they need more guidance, love, and care from their parents. Perhaps the best known ceremony is "Ngaben," the cremation ceremony to purify the soul of the death. Many visitors to Bali find themselves enthralled by the cremation rituals, which can go on for days with much pomp and celebration. Another highly visible ceremony is Galungan, which occurs every 210 days (it's timed to the Balinese calendar). This Balinese festival celebrates a day of victory against an the notorious Mayadenawa, an evil king that ruled in Bali centuries ago. Kuningan day, 10 days after Galungan, is the day to commemorate the spirits of the heroes who were killed during the battle against Mayadenawa. Another busy day today. We left early to catch the Barong dance at Batubulan. This is one of the famous Barong dance troupes, a great tourist draw, and, judging by the fancy stage, bleacher seating, and overall high quality of the production, quite a lucrative business for the local Balinese who put it on. It was fortuitous that we'd seen the Calonarang performance the night before. The Barong is in many ways Calonarang's (Rangda's) counterpart on the light side - a mythical beast with great powers to overcome evil and black magic and restore the balance between the light and dark forces that is so important to the Balinese. The Barong is a huge shaggy-coated beast controlled by two men (front legs and back legs) - spiritually very powerful, but also playful and inquisitive like a kitten. We had seen the beautiful restored Barong at Tunjuk when we had visited Sumandhi, and had also seen a different, shorter version of this dance in Peliatan at the beginning of our trip, but this was our first full performance. Although not apparent to Western audiences, and not made clear in the program notes given out at the performance, the Balinese will know the background of the god Siwa (the Indian Siva), one of the trinity of Hindu gods along with Brahma and Wisnu. Siwa is the destroyer, although this aspect of destruction is viewed as an integral part of the cycle of death, decay, and renewal that is essential to life on earth. Siwa's wife has many aspects each with their own name, some loving, and others an extension of the destructive aspect. Durga is one of those aspects, and definitely in the destructive camp. Queen of Witches and Goddess of Death, she is often represented as the widow Rangda or Calonarang. The underlying plot of this drama, which is an episode from the Mahabharata epic, is Siwa's wish to have his wife Durga united with him in heaven. In order to do so, she must be purified and transformed from a witch. (Many thanks, again, to Judy Slattum and her excellent book "Masks of Bali" (Chronicle Books) for her vivid explanation of this drama). Bali’s varied landscape of hills and mountains, rugged coastlines and sandy beaches, lush rice terraces and barren volcanic hillsides provide a picturesque backdrop to the colorful and deeply spiritual culture of this "Island of The Gods." 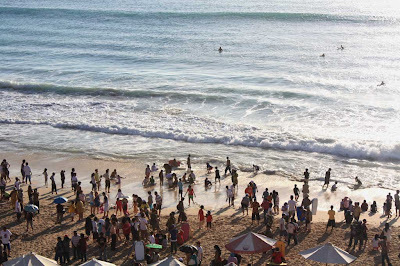 First discovered by an international community of traveling surfers and hippies, you can party til dawn in the beachside clubs at Kuta and then sleep on the long, wide beach the next day. For a calmer, more spiritual escape, you can check out the temple sites on Bangli, scuba dive in the global center of bio-diversity off the coast of the island, shop in the unique markets, or simply spend your days swaying in a beachside hammock. From outdoor activities to spiritual escapes to beach relaxation, Bali has a lot to offer travelers with a spirit for adventure and a desire to see one of the most beautiful islands in the world. 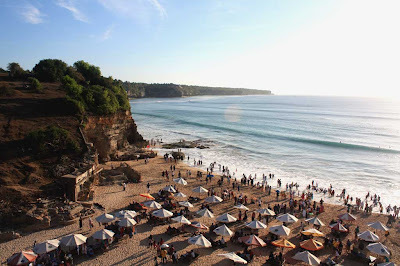 No matter what your travel style or budget is for your trip to Bali, there are lots of options for travelers to customize their dream vacation. We’ve got some great deals on airfare to Bali. Once you’ve got your ticket booked, you can check out the many accommodation options on the island which you can both read about and book right here on our site and range from luxury resorts, to cheap, backpacker hostels, mid-range hotels, villas and guest houses. So, you’ve got your ticket in hand, your hotel booked and now you need some ideas on what to do when you arrive in Bali. Want to scuba dive among some of the most impressive sea life in the world? Surf some of the best waves in warm waters? Hang out at the beach? 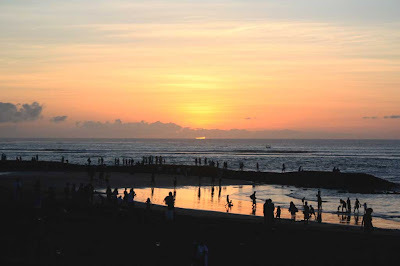 Or maybe you’d like to sign up for a tour to get the most out of your trip to Bali. Whatever you’re looking for, we’ve got it here. In the pages of WhyGo Bali, you’ll find everything you need to plan your trip to this Indonesian island of paradise. Whether you are on the hunt for the best deals on your airfare or you’d like to get the inside scoop on hotel and hostel options in Kuta or Lombok, you’ll find all the best resources just a click away. Want to know how to navigate the local culture and find the hidden gems most guidebooks skip? We’ve got the most comprehensive guide on Bali out in the world of the wide web, with experts who have lived and traveled there giving you tips, information and ideas on how to make the most of your trip to Bali. 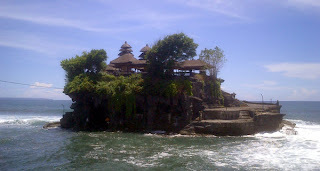 So, join our community of Bali lovers and travelers, pack your swimsuit, and get ready for the adventure of a lifetime! JAKARTA, June 3 (Xinhua) -- Indonesia will host the 9th International Congress on the Anti Immune Deficiency Syndrome (AIDS) in Asia and the Pacific region (ICAAP) which will become the biggest in the region, an organizing committee official said here on Wednesday. "As of now we have received attendant applications filed in by 5,700 people from 65 countries and more than 2,700 articles to be read out during the congress," Zubairi Djoerban, a local organizing committee of the congress official told a press conference here. The Indonesian AIDS society chairman said that the 9th congress will be themed "Empowering People, Strengthening Network," aimed at empowering people across the region to mobilize a holistic and more affective response to the cross border disease. Zubairi said that the biennial congress, scheduled to be opened by Indonesian President Susilo Bambang Yudhoyono, will be held from August 3 to 13 in Bali. The congress will release programs and discuss the scientific inventions and policy developments in the global response to HIV/AIDS, he added. The congress, he said, is organized by the AIDS Society of Asia and the Pacific (ASAP), he said. Zubairi explained that the appointment on Indonesia to host the congress is based on the fact that Indonesia was one of the first Asian countries to develop a far-sighted national policy that provided legal immunity for people living with HIV (PLHIV) to seek medication officially in appointed institutions. According to the data issued by the Independent Commission on AIDS in Asia in 2008, AIDS remains the most likely cause of death and loss of work among people aged 1544. The data also say that the number of PLHIV in Asia was estimated at 5 million by 2007. To reach the Millennium Development Goals (MDGs) on HIV and AIDS, member countries are required to halt and reverse the spread of the epidemic by 2015. 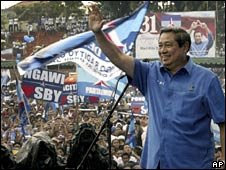 Indonesian President Susilo Bambang Yudhoyono is looking to secure a second term in office as campaigning for the 8 July vote officially opened. Opinion polls indicate he is the favourite after his Democratic Party nearly tripled its share of the vote in April's parliamentary elections. Competition is led by former president Megawati Sukarnoputri and former vice-president Jusuf Kalla. Officials said they were confident of a fair and peaceful vote. Democracy was only established in Indonesia after the fall of Suharto's military-backed rule in 1998. Mr Yudhoyono has said he wants a second term to fulfil his promises to clean up corruption and secure economic growth amid the world recession. A former general, he has ditched his former vice-presidential partner, Jusuf Kalla of the old-established Golkar Party, in favour of the former central bank chief, Boediono (who uses only one name). Ms Megawati was defeated by Mr Yudhoyono in the 2004 elections, which were the first to produce the country's head of state by direct elections. Mr Kalla's decision to run separately for president complicates the race, which will go to a second round in September if no clear winner emerges. The grand opening of Bali Swiss Villa on February 22nd, 2009. Welcome to our villa and enjoy the celebration. We thank you all for coming and for all of your support. Check out our website at www.baliswissvilla.com any feedback or comments will be greatly appreciated.